If you exceed your work period without taking your recommended break duration, a notification like this will appear and it's time to take your break. Should you be in the middle of some important work and wish to suspend having your break, simple click the 'Suspend' button. Doing so will prevent subsequent reminders and your achievement rating will not decrease during this time. This button offers simple suspend durations such as '15 minutes' and '30 minutes'. The 'Until next rest' button will suspend further reminders until either your next break period is automatically detected or until you state that you are rested. This can be useful when using an application that prevents the computer from sleeping by mimicking user activity. Should one of your Planned Break be scheduled to occur within the next 60 minutes of a notification, this will be indicated next to a clock symbol. This will also make available the suspend option 'Until Planned Break'. The 'I am rested' button confirms that you are rested and wish to start a new work period. Whenever the time matches one of your specified Planned Breaks, a notification will always be display and will cancel any remaining notification suspension period. The current break status is reflected in the programs notification icon available in the Windows Notification Area. - Time for a break from your work. - You have suspended break notification messages. - A lack of computer interaction suggests you are having a break. 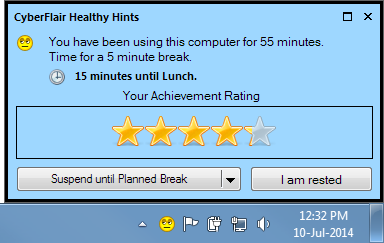 At any time, you can left-click this icon to display Healthy Hints main screen. Right-clicking will bring up the program menu. From here you can restart your work period by selecting 'I am rested' or suspend rest notifications. By default, Healthy Hints displays its own design of notification window that gives you a greater depth of information and control over that of the standard Windows notification. However, if you would like to change the style to that of the standard appearance, you can do this under the Notifications section of the program's options. As the style you choose also affects which notification sound is played, details about changing this sounds are available under Notifications help.